Walt Disney World Resort will kick off the “Coolest Summer Ever” with a 24 hour special event at the Magic Kingdom. Take a live look inside the Magic Kingdom for the next 24 hours. 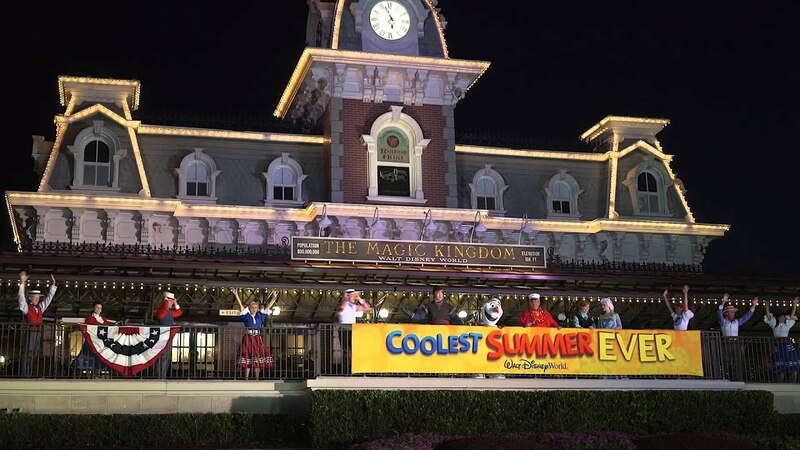 See this morning's opening of the 'Coolest Summer Ever' with the Magic Kingdom Welcome Show. The Coolest Summer Ever is about to begin at the Magic Kingdom. Get all the times and details you need to plan your 24 hour day at the Magic Kingdom this weekend. Walt Disney World Resort will kick off the “Coolest Summer Ever” with a 24 hour special event May 22-23 at the Magic Kingdom, hosted by Olaf from Disney’s blockbuster animated hit “Frozen." The Magic Kingdom will be open 24 hours to guests from 6 am to 6am, Friday May 22 to Saturday, May 23 2015. Guests are invited to come in costume to show their Disney Side while a selection of favorite attractions, entertainment, special event merchandise, plus food and beverage are on tap all night long to celebrate the start of the “Coolest Summer Ever” at Walt Disney World Resort. As always, check with the Times Guide in the park for any last minute changes to this unofficial schedule. Move It!, Shake It!, Dance and Play It! Friday: 9:30am, 5:40pm, Main Street, U.S.A.
Disney Channel Grand Marshals appearing in the 3pm parade. Friday: 8:45pm, 9:45pm, Saturday 12:15am, Main Street, U.S.A.
Saturday: 5:45am Railroad Station Main Street, U.S.A.
FastPass+ will be available from 6am to 3am. From Walt Disney World Resort hotels, bus transportation is set to begin at 5:15am on Friday, continuing through the entire 24 hour event. Resort watercraft operation begins at 5:15am. If you are arriving by car, the Transportation and Ticket Center parking lot will be opening at 4:30am on Friday, with Ferry service beginning at 5:15am. The Express monorail will be operating from 5:20am on Friday to 6:30am on Saturday. The Epcot monorail will be operating from 8am on Friday to 6:30am on Saturday, then from 9:00am on Saturday to 11pm on Saturday.